Whether you have a grand southern Victorian, a quaint coastal cottage, or a modern home made of concrete and steel, choosing the right paint color can make or break its curb appeal and resale value. The choice of both your interior and exterior paint color should compliment the style of your home and suit your tastes as well. There are a few basic rules to make certain that the color you choose is the perfect one. The first consideration in choosing an exterior color for your home’s style is the neighborhood in which you live. Your home should blend in with others around it. Perhaps you are the type of personality who wants to stand out. This is a personal choice, but in the end it can make your home into an eyesore and detract from its value. Certain neighborhoods and communities have restrictions on the types of color that can be used for exterior paint. Failure to comply can land you a hefty fine. You need to make sure that there are no restrictions in your area. This is especially the case in certain historical districts. There are certain types of homes that should not be painted, including stucco or stone. They are meant to be admired for their natural beauty. The exterior of your house will be seen by more people than the interior of your home. You will see the interior more than others. This is where you can get personal and choose colors that you enjoy. There are certain features in the interior that may dictate the color scheme. For instance, the color of hardwood floors, existing ceiling tile, a natural stone fireplace, or your furnishings may have an influence on the colors that you choose. Colors can be used to create a certain mood. You can choose warm colors such as reds, oranges, yellows, and earthy browns to create a warm and inviting feeling. Certain reds may make you feel energetic or increase the energy in the room. Cool colors such as blues, greens, bluish grays, and purples will have a calming effect. Neutral tones are often peaceful and serene. Regardless of the mood you wish to create, if you use colors that do not work well with your home’s style, they will look out of place. For instance, using bright primary colors in a home that features traditional dark woods and ornate crown molding may look out of place. However, the same primary color may be the perfect choice for a modern home with clean lines. Accent colors are important because they help to draw attention to the best features of your home. However, you must be aware that the accent colors can completely transform the main color of either the interior or exterior and give it a completely different look. When choosing accent colors, you must consider the color wheel. In general, colors that are opposite on the wheel will create high contrast and a sense of tension or excitement. Colors that are next to each other on the color wheel will have a more calming effect. Once again, the style of your home will dictate the colors that look best. If you have a historic home, choosing colors that reflect the time period of your home can create interest and will often easily complement other homes in the neighborhood. Choosing a paint color that complements your home style, both on the interior and exterior, can be a difficult process. Hiring a professional to help you choose may be your best option. Consistency is the key when choosing the right color for your property. You will have to live with your choice for a long time, so it is best to take your time and get something that you will be happy with in the long haul. Quirky colors may seem trendy or fun at the moment, but they wear off soon. 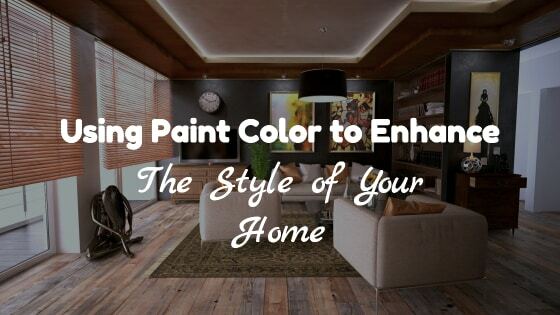 Sticking with colors that match your home is the best way to ensure that you will enjoy its colors for a long time. Hiring a professional can make the process go smoothly and have the best results.